Inspiration to help you with toddler chores and your own housework! The other day when I was chatting to a friend on Skype she excused herself to go and tidy up after her hurricane toddler as her toddler was now asleep. I remembered those days with a chuckle as this description is just so apt! Most children, with diligent persistent but gentle training, become more careful about the mess they create, but there are some who just tend to be messier than others. We have one wonderfully creative child who doesn't see mess  it all looks like an abstract painting to her! Moms often despair over the mess that one or a few young ones can make in a relatively short time span and can feel like they spend the whole day cleaning up after their little ones. Our second home after children was a small open plan house that was full and busy with three little ones 4 and under, 2 dogs, 2 cats and two adults with all the paraphernalia that goes along with that. I used to clean my home early in the morning, straight after breakfast, while my children were playing happily. As they grew older I started to get them involved in cleaning with me after they had done their very basic hygiene chores. Yes this caused the cleaning period to be twice as long, but we were able to chat as we went and heart issues were taught as child training issues came up. My toddlers are now all grown up and these early years have stood me in good stead. The training they had as little tots, when I came alongside them and helped them to do their jobs properly, has paid off as they all know how to do a range of jobs throughout the house. 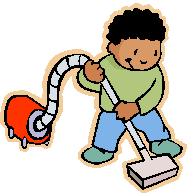 It is very tempting to leave all your housework for when your toddlers are asleep or to clean up after them to avoid tantrums or conflict. And there are times when this is actually the only way to do certain tasks. For instance returning phone calls or replying to emails is a magnet for toddlers to get up to mischief whether it be unpacking your desk or emptying a kitchen cupboard. But there are also other ways to cope with hurricane toddlers who leave a trail of destruction behind them. Limit their toys  either have boxes of toys that you can cycle on a weekly or monthly basis, or go through their toys and only keep those that they really play with. Start teaching them from young not to touch other peoples things. Cell phones, keys, cameras and TV remotes are always enticing to little ones. If you let them have them once, then you are setting a precedent. Avoid this at all costs. Ensure that they have a nice extended time outdoors everyday to burn off their excess energy. Get a group of moms together and meet at a park with climbing frames. Take them for a walk in a safe open place or just set up some outdoor play toys for them. I still help my 9 year old stay on task. Doing chores is a lifelong task that we all have and the sooner you start the easier it will be for you later on.